You’ll see in this episode a trailer from my film Beef Boys. (You can see the movie poster on the right column of this page.) I’m proud of my work in this award-winningfilm. When you’re working with the kind of script that I wrote, it’s not hard to act. It flows so smoothly, like sausage through a grinder. I really encourage you to visit the film in its entirety here: http://www.youtube.com/usofbeef. This entry was posted on Tuesday, November 17th, 2009 at 6:34 pm	and is filed under Episode 3. You can follow any responses to this entry through the RSS 2.0 feed. You can leave a response, or trackback from your own site. 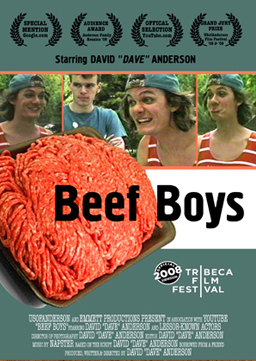 BEEF BOYS needs a sequel.